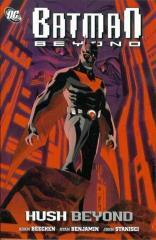 A new graphic novel inspired by the fan-favorite animated TV series Batman Beyond! Terry McGinnis – the Batman of the future – and an elderly Bruce Wayne – the original Batman – are the sworn protectors of Neo-Gotham. But when someone targets The Dark Knight’s old foes, the new Batman must begin a case that reaches back into Bruce Wayne’s past and puts Terry’s future directly in danger.